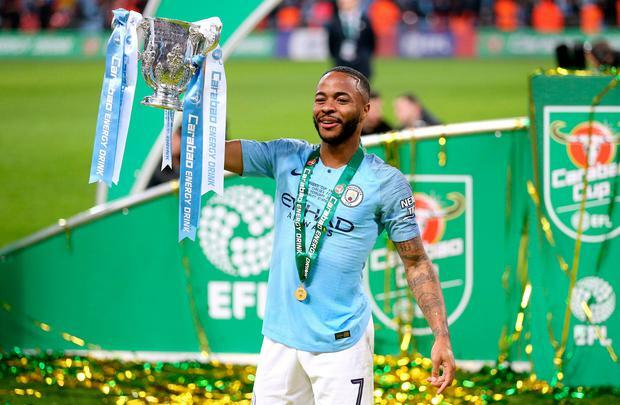 Raheem Sterling fired home the winning penalty. The drama of the closing minutes, which heaped more pressure on the beleaguered Chelsea manager, proved to be the main talking point of what was otherwise a drab encounter. Sarri's tactics, however, had been relatively successful after the 6-0 mauling Chelsea suffered at the hands of City just a fortnight ago. With Eden Hazard playing as a 'false nine' and Gonzalo Higuain on the bench, the Londoners set out purely to contain. Although Jorginho's fouling of Sergio Aguero seconds after kick-off was a bit unnecessary, it was an approach that frustrated City. As expected, Pep Guardiola's men dominated possession but they found it difficult to create chances. Aguero did threaten when he controlled a Bernardo Silva cross but he fired over and another effort was deflected into the arms of Kepa. Chelsea's best opportunity of the opening period came when Hazard got the better of Aymeric Laporte in the area but his shot was blocked. City upped the tempo after the break and Aguero thought he had opened the scoring with a low shot but the flag was raised for offside. Replays suggested it was a tight call but the decision stood after a VAR check. City applied more pressure but the frustration continued and Chelsea almost caught them on the counter-attack as Hazard cut back for N'Golo Kante but the Frenchman missed the target. Ross Barkley also curled an effort over. City threatened again with a quick raid of their own but Antonio Rudiger halted the attack by felling David Silva. Sterling looked to have the beating of the Chelsea defence on another break but was blatantly bundled over by Jorginho. The Italian took a booking for his trouble and doubtless deemed it worthwhile as nothing came of the resulting free-kick. Ederson was called into action in stoppage time to palm over a Willian free-kick and Hazard was stopped in his tracks by an offside flag. City suffered a blow heading into extra time - with potential implications for the title race as well - as key midfielder Fernandinho limped off with an apparent groin injury. Chelsea had the best openings in the first extra period but Jorginho and Hazard failed to keep efforts on target. City went close after the restart when Sterling teed up Aguero but he was denied in a goalmouth scramble. Aguero had another opportunity when he wriggled clear as time ran down but Kepa saved his effort from the edge of the area. Kepa required treatment for cramp after that save - the second time the physios had been on to him in quick succession - and Sarri decided he had to be replaced with penalties looming. Former City keeper Caballero was poised but extraordinary scenes followed as Kepa refused to move. International Football Association Board (IFAB) rules do state that "if a player who is to be replaced refuses to leave, play continues." But that could offer no comfort to Sarri, who stormed off towards the tunnel, unable to conceal his anger. Amid the chaos, City kept their composure to claim yet more silverware.